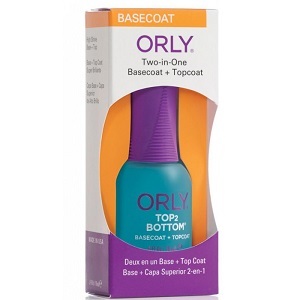 Orly Top 2 Bottom - Top Coat & Base Coat in one - .60 oz. Home > Top Coats, Base Coats, Nail Treatments & Cuticle Oils > Top Coats For Protected Long Lasting Manicures > Orly Top 2 Bottom Top Coat & Base Coat .60 oz. Orly Top 2 Bottom, top coat & base coat in one, .60 oz. It provides the convenience of a topcoat and basecoat in one bottle. It protects nail polish with a fast-drying, high-shine finish.